All experiments in this paper used the commercially-available PUREfrex® 2.0 kit as the standard PURE system. The well-known anti-HER2 antibody trastuzumab19 was selected as a model IgG for the optimization of synthesis conditions. Since the PURE system does not contain nuclease activity, linear (e.g., PCR product) or circular DNA can be used as the expression template. Therefore, LC- and HC-encoding template DNAs were constructed in a T7 promoter-driven PCR product format (Fig. 1b). As a first step, we tested whether IgG can be synthesized with the standard PURE system with only basic protein translation function. LC and HC template DNAs were simultaneously added to a total of 10 nM of the mixed PCR products (molar ratio of LC:HC = 1:1) to the PURE system and the reaction mixture was incubated at 37 °C for 16 hours. After centrifugation, the reaction mixture was subjected to reducing and non-reducing SDS-PAGE following by detection and quantitation in the gel by staining with fluorescent dye (Fig. 1c). As shown in reducing SDS-PAGE, both LC (23.6 kDa) and HC (50.6 kDa) were synthesized (to 166 µg/mL and 116 µg/mL, respectively) using the standard PURE system without optimization. However, all of the synthesized LC and HC were pelleted by centrifugation (lane “pellet”); notably, whole IgG (148.3 kDa) was not observed on non-reducing SDS-PAGE (lane “sup”). This result indicated that the synthesized LC and HC needed to be solubilized to permit assembly of whole IgG. Therefore, the improvement of IgG synthesis by constructive approach based on the PURE system was attempted, as follows. In separate work (Supplementary Fig. S1), we showed that Fab and scFv derived from trastuzumab could be synthesized in soluble and active forms by adding a molecular chaperone DnaK and its cofactors (DnaK mix) and a disulfide bond isomerase DsbC to the reaction mixture. Therefore, enhancement of IgG synthesis with the PURE system was attempted here using the same approach. First, DnaK mix was added to the PURE system to improve the solubility of LC and HC. DnaK is a cytoplasmic molecular chaperone HSP70 from E. coli20,21 and the 1× DnaK mix consists of 5 μM DnaK and its cofactors DnaJ and GrpE at 1 μM each. Both the synthesized LC and HC were partially solubilized by addition of this molecular chaperone (“0 μM DsbC” in Fig. 2a). The amounts of soluble LC and HC were 41 ± 12 µg/mL and 51 ± 4 µg/mL (mean ± SD), respectively. 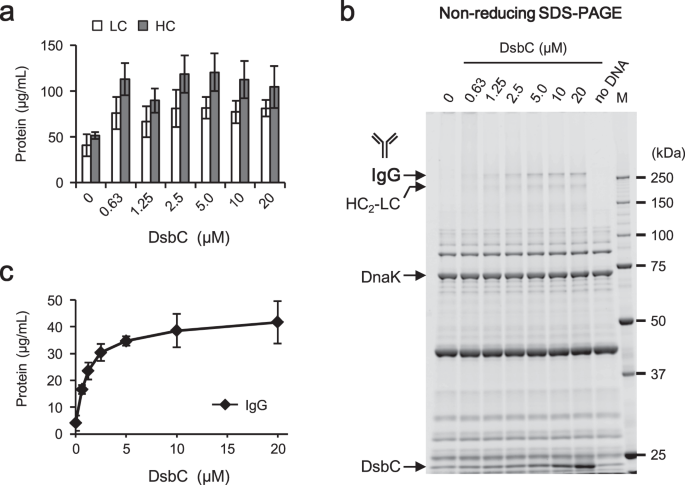 However, whole IgG was not observed with non-reducing SDS-PAGE (“0 μM DsbC” in Fig. 2b,c). This result indicated that another challenge for IgG synthesis with the PURE system was how to promote the formation of intermolecular disulfide bonds between LCs and HCs. Optimization of DsbC concentration. The reactions were performed using the PURE system supplemented with 0 to 20 µM DsbC, 3 mM GSSG, 1× DnaK mix, and 10 nM mixed template DNA (molar ratio of LC:HC = 1:1). Incubation was performed at 37 °C for 16 hours. After centrifugation, the supernatant was subjected to quantitative analysis. Specifically, the total soluble LC and HC (a) and the whole IgG (b,c) in the same sample were quantitated with reducing and non-reducing SDS-PAGE. All data represent the mean and standard deviation of three independent experiments. M, molecular weight marker. Next, DsbC, which promotes correct disulfide bond formation in the E. coli periplasm22,23,24, was added at various concentrations to the PURE system. Specifically, the synthesis reactions were performed with the PURE system supplemented with 0 to 20 μM DsbC in the presence of 1× DnaK mix and 3 mM GSSG as a source of oxidizing activity. Synthesized LC and HC were solubilized to higher levels in the presence of DsbC (Fig. 2a). The amounts of soluble LC and HC obtained with 0.63 μM DsbC were 76 ± 17 µg/mL and 113 ± 18 µg/mL, respectively. Whole IgG was not observed without DsbC, but was detected at increasing concentrations as the DsbC concentration rose (Fig. 2b,c). The HC2-LC trimer also was observed as a band smaller than that of whole IgG. IgG was fully synthesized (at 35 ± 2 µg/mL) in the presence of at least 5 µM DsbC. This result suggested that DsbC plays a critical role in the formation of intermolecular disulfide bonds as well as in the solubilization of LC and HC. The PURE system usually contains 1–3 mM DTT as a reducing agent17; the redox state of the reaction can be controlled by altering the concentration and the ratio of reducing and oxidizing agents. As a next step, the effect of the reducing agent on IgG synthesis with the PURE system was examined (Fig. 3a,b). Synthesis reactions were performed in the presence of 2 mM of various reducing agents in combination with 3 mM GSSG, 5 μM DsbC, and 1× DnaK mix. Different reducing agents did not yield apparent effects on the amounts of synthesized LC and HC (Fig. 3a). However, the amount of IgG generated varied depending on the reducing agent employed (Fig. 3b). When DTT or Tris (2-carboxyethyl) phosphine (TCEP) was added to the reaction mixture, the amount of IgG generated was about the same or lower than that obtained without reducing agent. GSH gave a relatively larger amount of IgG among the tested reducing agents. Optimization of redox state and chaperones. (a,b) The effect of reducing agents on IgG synthesis. The reaction was performed with the PURE system containing one of the indicated reducing agents (at 2 mM), 3 mM GSSG, 5 μM DsbC, 1× DnaK mix, and 10 nM mixed template DNA (molar ratio of LC:HC = 1:1). Incubation was performed at 37 °C for 16 hours. TCEP, tris (2-carboxyethyl) phosphine; MPD, 3-mercapto-1,2-propanediol; 2-ME, 2-mercaptoethanol. (c,d) Optimization of GSSG concentration. The reaction was performed with the PURE system containing 2 mM GSH instead of DTT, 0 to 12 mM GSSG, 5 µM DsbC, 1× DnaK mix, and 10 nM mixed template DNA (molar ratio of LC:HC = 1:1). Incubation was performed at 37 °C for 16 hours. (e,f) The effect of molecular chaperones and chaperone-like proteins on IgG synthesis. The reaction was performed with the PURE system containing 2 mM GSH instead of DTT, 3 mM GSSG, 5 µM DsbC, the indicated chaperones, and 10 nM mixed template DNA (molar ratio of LC:HC = 1:1). Incubation was performed at 37 °C for 16 hours. After centrifugation, the supernatant was subjected to quantitative analysis. The total soluble LC and HC (a,c,e) and the whole IgG (b,d,f) in the same sample were quantitated with reducing and non-reducing SDS-PAGE. All quantitated data represent the mean and standard deviation of three independent experiments. The concentration of GSSG as an oxidizing agent then was optimized (Fig. 3c,d). Synthesis reactions were performed with the PURE system containing 0 to 12 mM GSSG in the presence of 2 mM GSH, 5 μM DsbC, and 1× DnaK mix. There was no effect of the concentration of GSSG on the amounts of synthesized LC and HC (Fig. 3c), while the highest amount of IgG was observed at GSSG concentrations between 0.5 and 4.0 mM (Fig. 3d). Based on these results, GSH and GSSG were used at a molar ratio of 2/3 mM in the susbsequent experiments. These results indicated that the type of reducing agent and the ratio of reducing and oxidizing agent were important for IgG formation. Chaperone-like proteins FkpA and Skp have been reported to have significant effects on the synthesis of functional antibodies when scFv or Fab was co-expressed with FkpA or Skp25,26,27,28,29. FkpA, a periplasmic PPIase from E. coli, has a chaperone-like function independent of the PPIase activity24,30. Skp, a periplasmic protein from E. coli, shows chaperone-like activity for β-barrel proteins24. The effect of chaperone and chaperone-like proteins on IgG synthesis was examined in the presence of 2 mM GSH, 3 mM GSSG, and 5 μM DsbC (Fig. 3e,f). The amounts of soluble LC and HC were almost the same when the reactions were performed in the presence (“DnaK mix”) and absence (“no-chaperone”) of the DnaK mix and were slightly decreased in the “FkpA” and “Skp” reactions (Fig. 3e). Since both LC and HC were completely solubilized in the presence of 5 μM DsbC, further solubilization by the addition of chaperone was not observed. On the other hand, the amount of IgG varied depending on the added chaperones (Fig. 3f). DnaK mix gave the highest amount of the IgG with 1× mix. Both FkpA and Skp also had effects on IgG formation, although the effect was smaller than that obtained with 1× DnaK mix. This result suggested that DnaK was the most suitable chaperone for IgG formation among those tested. Furthermore, using several IgGs, including trastuzumab, we tested whether the DnaK mix and FkpA exhibited an additive effect on IgG formation. In the presence of both 1× DnaK mix and FkpA, however, the yield of trastuzumab whole IgG was decreased compared to that obtained with the 1× DnaK mix alone, and whole IgGs of the other molecules were not generated with the combination of 1× DnaK mix and FkpA (Supplementary Fig. S2). The optimal synthesis temperature of the PURE system is usually 37 °C, but for synthesis of aggregation-prone proteins, lower temperature (e.g., 30 °C) can prevent aggregation. Therefore, the optimal synthesis temperature of trastuzumab was examined by performing the reactions at 30, 37, or 42 °C for 16 hours (Fig. 4a,b). The amount of IgG was highest at 37 °C, although product also was synthesized at 30 °C and even at 42 °C. Optimization of the synthesis reaction conditions and DNA ratio. (a,b) Optimization of the incubation temperature. The reactions were performed with the PURE system containing 2 mM GSH instead of DTT, 3 mM GSSG, 5 μM DsbC, 1× DnaK mix, and 10 nM mixed template DNA (molar ratio of LC:HC = 1:1). Incubation was performed at 30, 37, or 42 °C for 16 hours. (c,d) Optimization of the incubation time. The above reaction mixture was incubated at 37 °C for 0 to 32 hours. (e,f) Optimization of the template DNA ratio. The above reaction mixture containing the indicated molar ratio of LC DNA and HC DNA (total 10 nM of mixed template DNA) was incubated at 37 °C for 28 hours. After centrifugation, the supernatant was subjected to quantitative analysis. The total soluble LC and HC (a,c,e) and the whole IgG (b,d,f) in the same sample were quantitated with reducing and non-reducing SDS-PAGE. All quantitated data represent the mean and standard deviation of three independent experiments. To examine the effect of incubation time, trastuzumab was synthesized for up to 32 hours at 37 °C (Fig. 4c,d). Protein synthesis in the PURE system usually plateaus after 4 hours at 37 °C. Likewise, the synthesis of LC and HC reached a plateau at 4 hours (Fig. 4c). However, no IgG was observed at that time (Fig. 4d). IgG was observed starting at 8 hours, with the level of the multimer gradually increasing through 28 hours. The highest amount of IgG was observed at around 28 hours, when the yield reached 74 ± 6 µg/mL. This result indicated that the formation of intermolecular disulfide bonds between the LCs and HCs required extended incubation under these reaction conditions. In simultaneous synthesis of multiple components of a protein using the PURE system, the ratio of the synthesized components can be controlled by changing the ratio of the template DNAs31. To maximize the yield of whole IgG, therefore, the molar ratio of LC DNA and HC DNA was optimized while holding the total template concentration at 10 nM (Fig. 4e,f). The amounts of synthesized LC and HC correlated with the ratio of the template DNAs (Fig. 4e). When the molar ratio of LC DNA and HC DNA was 1:2 to 1:4, the molar concentrations of synthesized LC and HC were approximately 1:1; the amount of IgG also was highest under these conditions (Fig. 4f). A summary of the optimization of IgG synthesis with the PURE system is shown in Fig. 5a. 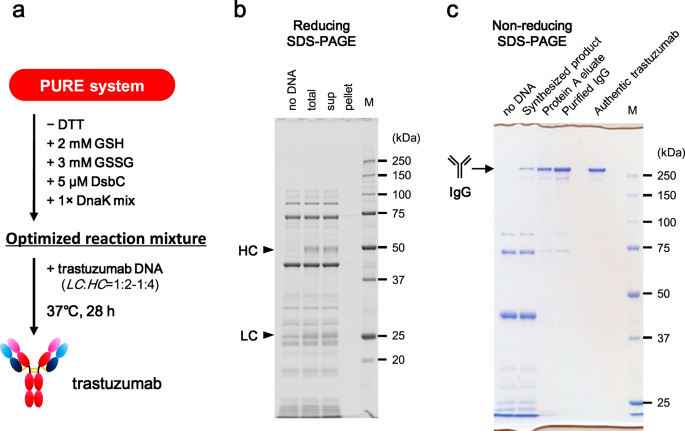 In the absence of DTT, the PURE system supplemented with 2 mM GSH, 3 mM GSSG, 5 μM DsbC, and 1× DnaK mix was a suitable reaction mixture for the synthesis of the trastuzumab IgG. The optimal molar ratio of LC DNA and HC DNA for trastuzumab was 1:2 to 1:4 when the total template concentration was set at 10 nM. The optimal incubation condition was 37 °C for 28 hours. Both synthesized LC and HC were solubilized completely under the optimized conditions (Fig. 5b), and whole IgG was observed in the same position as authentic trastuzumab (“Synthesized product” in Fig. 5c). The amounts of synthesized LC and HC in Fig. 5b were 84 µg/mL and 132 µg/mL, respectively. The yield of the whole trastuzumab IgG reached 124 ± 9 µg/mL (Table 1). IgG formation efficiency (the proportion of LC and HC which formed IgG out of the total synthesized LC and HC molecules; see Formula (1) was about 45% under these conditions (Table 1). Synthesis and purification of trastuzumab. (a) An overview of the optimized synthesis conditions for trastuzumab. (b,c) Synthesis of trastuzumab using the optimized PURE system and purification of the synthesized products. After synthesis, the reaction mixture (total) was centrifuged and separated into supernatant (sup) and pellet. The samples were subjected to reducing SDS-PAGE (12.5% gel) and subsequent fluorescent staining (b). Synthesized product was purified with Protein A resin (Protein A eluate) and subsequent gel filtration (Purified IgG). The samples were subjected to non-reducing SDS-PAGE (10% gel) and subsequent Coomassie Brilliant Blue (CBB) staining (c). Authentic trastuzumab was loaded at 500 ng/lane. M, molecular weight marker. Table 1 Summary of the synthesis of several IgGs with the optimized PURE system. Trastuzumab synthesized with the optimized PURE system was purified by Protein A resin and subsequent gel filtration (Fig. 5c). 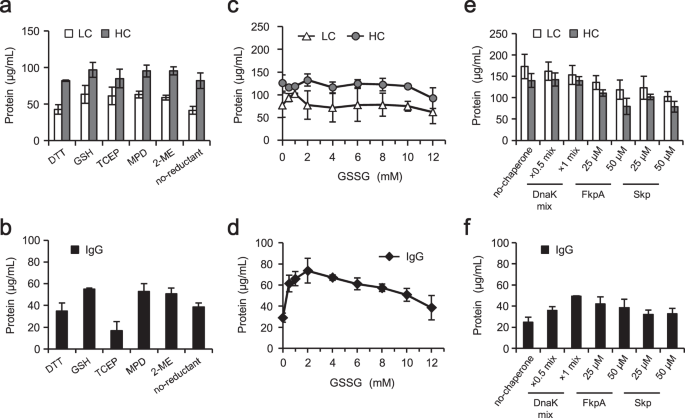 As a result, 131 µg of trastuzumab was obtained from 1 mL of the optimized reaction mixture, and 68 µg of purified IgG was obtained using a standard method for IgG purification. Purification yield was 75.4% at the Protein A eluate step and 51.7% at the subsequent gel filtration step. The activity of purified trastuzumab was evaluated. HER2, a transmembrane tyrosine kinase, is a binding target of trastuzumab and is overexpressed on the plasma membrane in numerous human breast cancer cells. In the breast cancer cell line BT-474, the surface-displayed HER2 bound by trastuzumab is internalized into the cells by endocytosis (Fig. 6a). It has been reported that a large portion of these HER2 receptors are returned to the cell-surface by the recycling endosome, with only a small fraction of the receptors entering into the lysosomal degradative pathway32. The activity of PURE-synthesized trastuzumab was tested by assessing internalization into BT-474 cells (Fig. 6b). Surface-labeled BT-474 cells with purified PURE-synthesized trastuzumab were incubated at 37 °C for 0 or 3 hours. Cells were then fixed and processed by dual-label indirect immunofluorescence microscopy. The visualized IgG was only observed on the cell surface before incubation (0 h). On the other hand, perinuclear dot stains following internalization were observed in addition to cell-surface staining after incubation (3 h). The dot stains partially co-stained with the late endosome and lysosome marker CD63 (Lamp3). Thus, the purified IgG showed internalization similar to that seen with authentic trastuzumab. Evaluation of the activity of purified trastuzumab. (a) A model of trastuzumab uptake and intracellular trafficking in HER2-expressing BT-474 cells. (b) Internalization analysis of purified trastuzumab. BT-474 cells were surface-labeled at 4 °C for 60 min with 10 nM purified IgG or authentic trastuzumab. Cells were washed and incubated at 37 °C for 0 or 3 hours, and then fixed and processed by dual-label indirect immunofluorescence microscopy. CD63 (Lamp3) is a marker of late endosomes and lysosomes. White arrowheads indicate partial co-localization of trastuzumab with CD63. Bar indicates 20 μm. (c) Binding kinetics of purified trastuzumab. Binding kinetics was measured by biolayer interferometry on an Octet RED96 system. 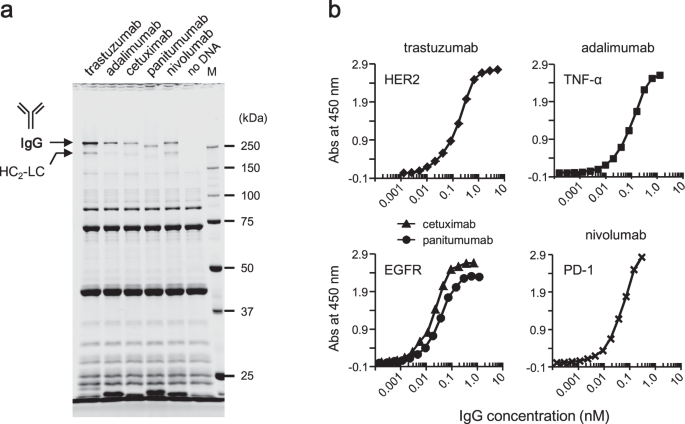 Purified IgG and authentic trastuzumab were loaded onto Anti-Human IgG Fc Capture biosensor, and affinities of the antibodies were measured using serial dilutions of recombinant HER2 protein. (d) Thermal stability of purified trastuzumab. Purified IgG and authentic trastuzumab were subjected to thermofluor assay using ProteoStat Thermal Shift Stability Assay kit and LightCycler 480 system. Tm1 and Tm2 represent the aggregation temperature. The binding affinity of purified IgG was measured by using biolayer interferometry (Fig. 6c). 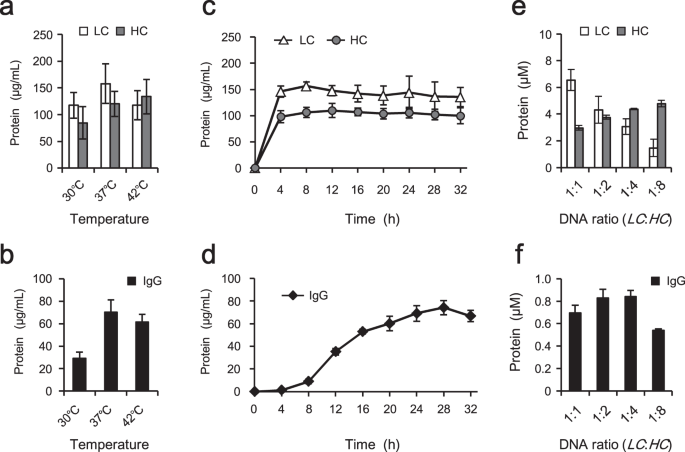 The purified IgG was loaded onto the Anti-Human IgG Fc Capture biosensor and affinity of the biosensor was measured against a serial dilution of recombinant HER2 protein. The dissociation constant (KD) of purified IgG was 4.24E-10 M, and the on-rate (kon) and the off-rate (koff) were 6.38E + 05 M−1s−1 and 2.70E-04 s−1, respectively. These values were similar to those obtained in the same assay using authentic trastuzumab (KD: 4.03E-10 M, kon: 6.29E + 05 M−1s−1, koff: 2.53E-04 s−1). The thermal stability of purified IgG was measured by thermofluor assay using a fluorescent dye that binds to hydrophobic patches exposed as the protein unfolds (Fig. 6d). The aggregation temperature measured by this assay matches closely with Tm as measured by differential scanning calorimetry (DSC), and Tm of trastuzumab measured in this assay was reported as 85.1 °C33. The aggregation temperature of purified IgG shifted to a little lower side compared with that of authentic trastuzumab (purified IgG, Tm1: 65 °C, Tm2: 81 °C; authentic trastuzumab, Tm1: 71 °C, Tm2: 84 °C). This difference may be due to the lack of post-translational modification. PURE-synthesized IgG has no sugar chains and the absence of sugar chains is known to lower the thermal stability of IgG34,35. These results demonstrated that trastuzumab synthesized using the optimized PURE system had activity similar to that of authentic trastuzumab produced with CHO cells although it is a little less thermostable. In addition to trastuzumab, other IgGs, including IgG1, IgG2, and IgG4 subclasses, were synthesized using the optimized PURE system. All tested IgGs were synthesized with the optimized reaction mixture described in Fig. 5a, exhibiting yields in the range of 33 ± 3 to 73 ± 2 µg/mL under the product-specific optimal conditions (Fig. 7a and Table 1; also see next paragraph). The binding affinity of these synthesized IgGs could be evaluated even without purification. Reaction mixtures containing the synthesized IgGs were serially diluted and tested by ELISA (Fig. 7b). Notably, the synthesized IgGs exhibited high binding affinity for their respective native target antigens, exhibiting affinities (EC50) in the sub-nanomolar range (Table 1). Cross-reactivity to other antigens was not observed for any of the tested cases (Supplementary Fig. S3). Synthesis of various IgGs. (a) Results of the synthesis of several IgGs using the optimized PURE system. The synthesis reactions were carried out with the PURE system containing 2 mM GSH instead of DTT, 3 mM GSSG, 5 μM DsbC, DnaK mix, and 10 nM mixed template DNA. Incubation was performed for 28 hours. Synthesis temperature and template DNA ratio (molar ratio of LC:HC) were optimized for the individual IgGs as shown in Table 1. After centrifugation, the supernatant was subjected to non-reducing SDS-PAGE (10% gel). M, molecular weight marker. 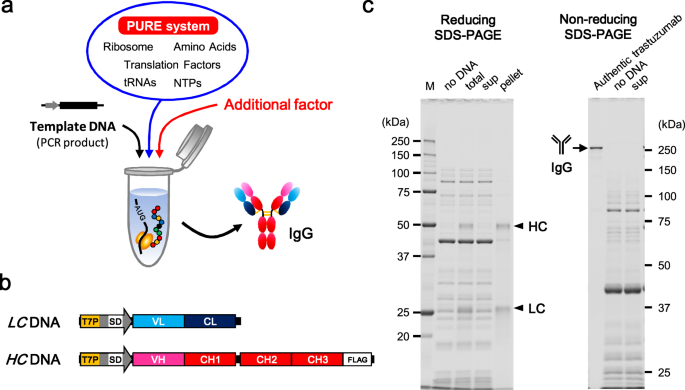 (b) Analysis of binding of synthesized IgGs to each antigen. The reaction mixtures including the synthesized IgGs were serially diluted and applied to ELISA without purification. The best conditions for the synthesis reactions differed among the tested IgGs. Testing of the synthesis temperature revealed that the amounts of IgG of adalimumab (IgG1) and panitumumab (IgG2) were the highest at 37 °C; both could be synthesized at 30 °C but not at 42 °C. (Table 1 and Supplementary Fig. S4). Cetuximab (IgG1) and nivolumab (IgG4) could be synthesized at 30 °C, but not at above 37 °C. The optimal template DNA ratio also differed for the different products (Table 1 and Supplementary Fig. S5). Adalimumab and nivolumab required more HC DNA to maximize the IgG yield, while cetuximab and panitumumab required more LC DNA than HC DNA. The IgG formation efficiency of the IgGs ranged from 12 to 30% under the respective optimal conditions (Table 1). Remarkably, despite having completely identical amino acid sequences outside of the variable regions (VL and VH), yields and optimal conditions differed between IgG1 members trastuzumab, adalimumab, and cetuximab. Therefore, the difference in optimal conditions between individual IgGs reflected differences in the complementarity-determining region (CDR) sequences and structures. These results suggest that it is possible to synthesize various functional IgGs by using the optimized PURE system, although the synthesis temperature and the template DNA ratio will need to be optimized for individual IgGs for the best yields.